BugDoc Dave here for another Stretch Tuesday! I’m going to continue with my discussion of mayonnaise pieces in stretch. I have to apologize that the last one got a little jumbled up, so let me quickly review the Fenton and Northwood mayos. 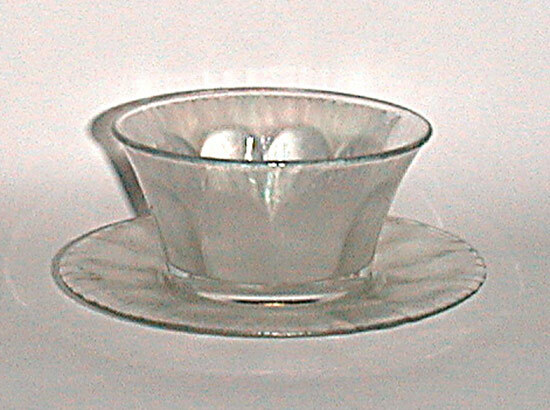 Fenton made two that they called mayonnaise servers, a #923 with a round top which also comes with a Laurel Leaf design around the top rim and an oval topped form. 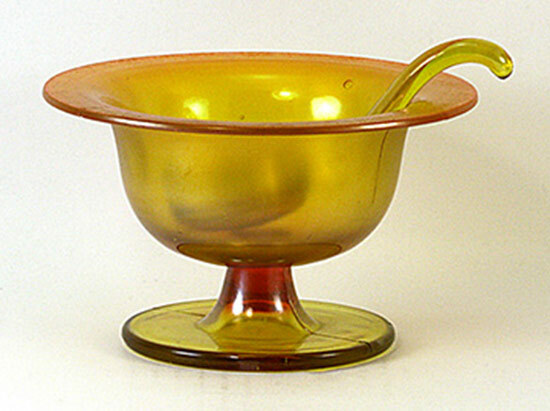 Northwood had two mayos, one a small dish and plate (#621 plus #675) set and the other a footed comport-type (#704) which can have a flared top or a rolled rim. Imperial made several mayonnaise and plate sets and all have been identified in various catalog pages. 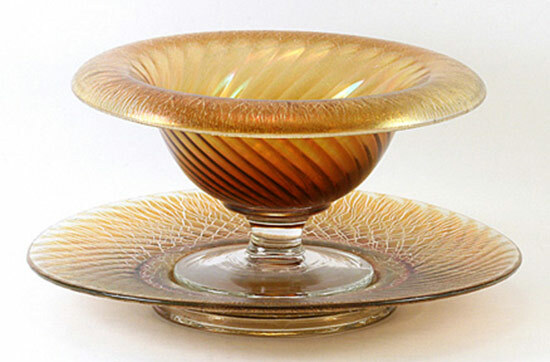 Like Northwood, Imperial made some bowls and underplate-style sets. 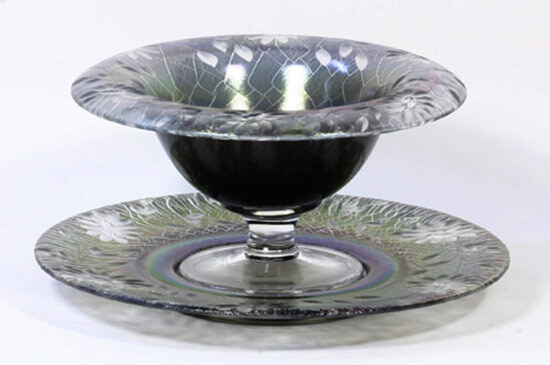 The #602/2B bowl with an underplate, both of which have wide optic panels. Both are also “stuck up” pieces which means they will have ground bases. 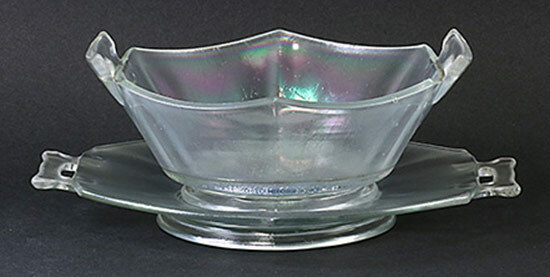 The bowl is about 4 ½-inch wide and the plate runs about 6-inches across. The set is most commonly found in Iris Ice (crystal stretch), Blue Ice (teal) and Ruby. The other bowl and plate set is the #725 line set. This line uses a hexagonal shape and two handles. The bowl and plate of this set has a snap base. 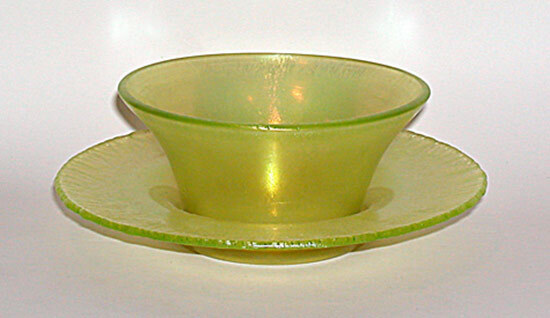 The bowl is about 5 ½-inches across and the plate is about 7 ¼-inch across. These are usually found in Iris Ice, Rose Ice (marigold) and marigold on pink. The crystal ones may also be decorated with a floral decal motif. 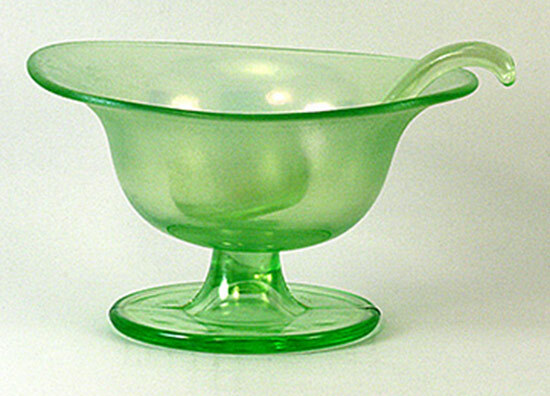 Imperial also made a comport-shaped mayonnaise and underplate set. This set can be plain with no decoration or the sets can often have cuttings. When they used a spiral optic plunger to make the mayonnaise and underplate, they gave it #313. These are usually found in Iris Ice, Blue Ice (smoke), Rose Ice and a few of the plain ones have been found in marigold or smoke on pink. Finally, they made a comport-style mayonnaise with the hexagonal top, but this time it’s #727 which doesn’t have the two handles. 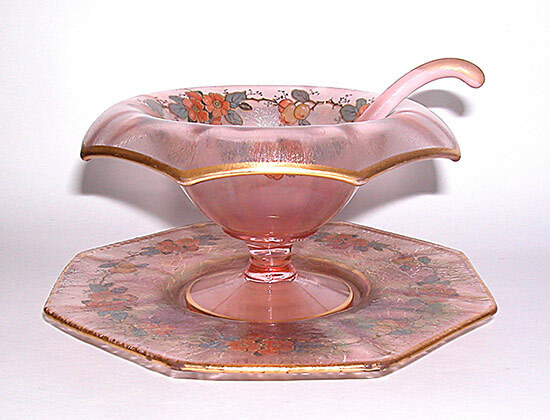 This set is most commonly found in Iris Ice and pink, but marigold on pink glass sets are also known. The one shown has the floral decal decoration. 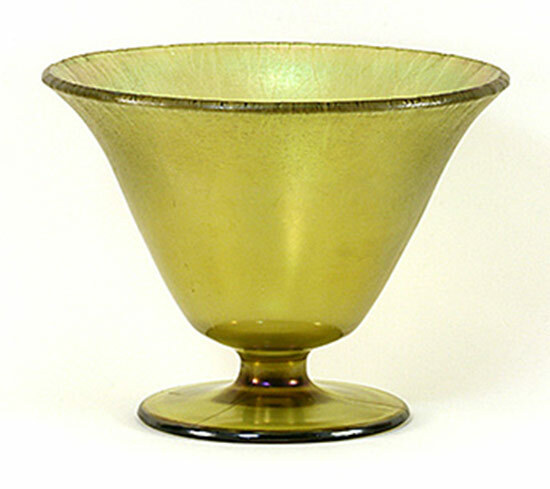 In my final installment on mayo sets, I’ll cover the mayo made by Lancaster Glass and the U.S. Glass pieces.